Giant otters live in South America, throughout the Orinoco, Amazon and La Plata River systems (mostly in the northern half of South America). They live in still or slow moving fresh water rivers, lakes and creeks. They have very streamlined bodies, with a well-muscled tail; both aid in swimming. They have short, dense chocolate colored fur, and usually have white markings on the underside of their throats. Giant otters are between 3 and 5 1/2 feet in length from head to tail, with females being smaller. Weights vary between 40 and 70 pounds. It is estimated the life expectancy is between 10 and 13 years in the wild. In captivity, that number increases slightly to the late teens. The giant otter is a piscivore (an animal that eats primarily fish). Specifically they feed on mostly catfish, perch and characins but also eat small snakes, caimans and crustaceans. At the Zoo, the two giant otters receive 4 pounds of fish a day (catfish, tilapia and trout). For enrichment, they enjoy hard boiled eggs, clams and squid. Peak breeding season is late spring and early summer, although some breeding takes place throughout the year. Mating occurs in the water and gestation lasts only 65-70 days. Litter size ranges from 1-5 individuals (usually 2-3). Cubs are kept in dens for the first few weeks, begin to open their eyes at a month old, and by 9-10 months are independent hunters. Many indigenous groups have folklore stories about giant otters. For example, the Achuar people of Ecuador and Peru believe giant otters are a form of tsunki, or water spirits. IUCN status – They are currently listed as endangered due to poaching and habitat destruction. Conflicts with humans also contribute to their endangerment. Fishermen often see the species as a nuisance, and ecotourism has increased the negative effects on giant otters. Land use restriction are required to properly maintain wild populations. Giant otters are keystone species for South America river systems. A keystone species is one that plays a critical role in the way their ecosystem functions. Without that species, the ecosystem would be dramatically different or cease to exist at all. This makes it very important to protect giant otters and their habitat. One simple way people can help many aquatic or semi-aquatic animals is by using the Seafood Watch guide. This guide recommends foods to buy or avoid, helping people select items fished or farmed in ways with the least amount of negative impact on the environment. Check out www.seafoodwatch.org for more information. The two giant otters are located in the Primate Building (also known as the Social Animals Building). The Zoo has two giant otters that joined the collection in 2013. They are sisters from two different litters. Lara is older, born January 31, 2011. Karina is the younger sibling, born November 3, 2011. 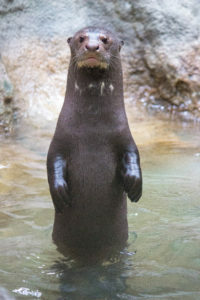 A giant otter’s throat markings are unique to each individual and are used to identify and recognize one another. The Zoo’s two females are easily identifiable using their throat marks. Karina has white vertical stripes, whereas Lara has a larger white patch.